Homemade hummus is as easy as throwing a tub of the premade stuff in a shopping cart. 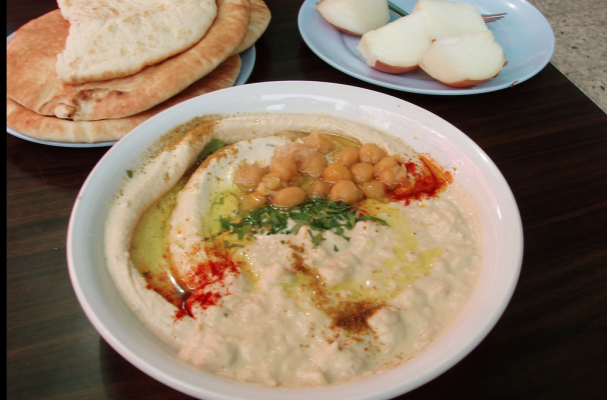 Every good hummus recipe has four essential ingredients: chickpeas, tahini, lemon juice and garlic. Tahini is a sesame seed paste that can be found at specialty food stores, Middle Eastern markets, or online. These days, it's readily available and should be easy to find. Once you know how to make hummus from scratch, you'll be hard pressed to spend $7 dollars on a five ounce container again. Prepare your hummus in a food processor or blended. This will ensure that every ingredient is pureed to optimum smoothness. First, cream the tahini in the food processor with some lemon juice until it forms a paste. This base makes it easier for the chickpeas and other flavoring to blend together. If you want to make hummus the "way back when" traditional way, then stick with the dried. Otherwise, canned works just as well. One trick to creating ultra smooth hummus is removing the chickpea skins prior to pureeing. Depending on how much time you have, you can warrant if this step is necessary or not. Either way, the final product will be delicious. Also, add the chickpeas to the food processor in two stages to allow for optimum creaminess. There are so many factors that can contribute to a hummus that's too thick. To remedy this issue, simply add a couple of tablespoons of water while the food processor is on to thin it out. It's not rocket science, it's just hummus. Add your sun dried tomatoes, roasted red peppers, chopped olives etc... at the end. It's up to you how smooth you want the hummus. Some prefer to have chunks of vegetables throughout their hummus while others like it smooth. Delicious! Puree the tahini in the food processor for about a minute until it becomes a paste. Then add the olive oil, garlic lemon juice, cumin and salt and pulse until the ingredients are well incorporated. Add the chickpeas (skinned or not) in two batches. Wait for the first batch to be completely smooth until the next one is added. The taste will vary. If you want the hummus to be smoother it is up to you to add more lemon juice or water to reach your level of smoothness. Pour hummus into a bowl. Garnish with garbanzo beans in the middle of the bowl, paprika (hot or mild), and add your best extra virgin olive oil on top. Serve with warm pita bread (whole wheat preferred).